At times this week, we awakened to gray skies and rain beating a staccato rhythm that shunned meter and metronome. A puckish wind capered in the eaves and ruffled tiny leaves in the garden like decks of playing cards. A thousand and one little waterfalls appeared out of nowhere, and limpid, impromptu streams danced their way through village gutters carrying twigs, oak leaves, pine needles and fallen petals. Here and there were precious islands of stillness. 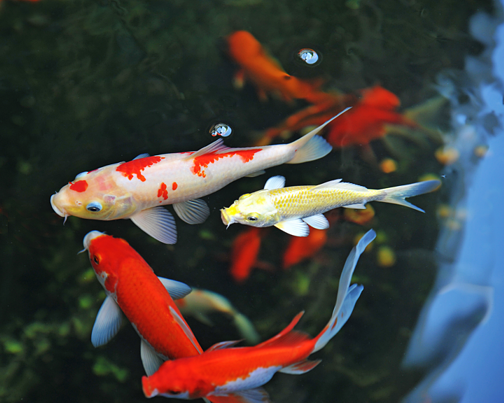 Sheltered by overhanging trees, a friend's pond was like glass, its white and scarlet koi hovering almost motionless in the early light with their open mouths like tiny perfect "o"s. Sometimes they seemed to be swimming in sky. There was water in our garage for an hour or two, and the old Passat rested in a shallow pool until the accumulation gurgled its way down through frantically working drains. When the waters receded, I scooped rust from an old spade into mason jars. Natural iron oxide pigments produce lovely ochres and umbers, and my gleanings will be used in various projects during the coming months, possibly on other rainy days. Claiming my rusty bounty, I remembered that humans have used iron oxides in artistic undertakings as far back as the prehistoric caves of Lascaux - I would be a happy camper indeed if I ever managed to produce something a scrap as vibrant as the Chinese horse. I thought too about the fact that a heady brew of rust (iron oxides), carbon dioxide and water is where all sentient life begins, and that the Japanese word for rust is sabi (錆) as in wabi sabi (侘寂), the all enfolding aesthetic or world view centered on notions of transience, simplicity and naturalness or imperfection. Clouds and rain, then sunshine and blue sky, and back to clouds and rain again. Who knows what the day will hold? If good weather prevails, we will be off into the woods. If not, we will read, listen to a little Rameau on the Bose and drink tea. We will watch raindrops dappling the windows, the painterly way in which trees, little rivers and old wood fences are beaded with moisture and shining in the grey. Each and every raindrop is a minute world teeming with vibrant life, whole universes within looking up at us, great and bumbling creatures that we are. Up and down, in and out, them and us, it's all good. Your post is perfect for today. It has been raining off and on the whole week. Today is another rainy and cloudy day. Each day brings something different so you have to stay open to it, right? Have a blessed Friday, Cate. I have a rain cloud and another type of cloud hanging over our house and your post does make me want to be there with you and the tea!